Childish Gambino's "This Is America" (Wolf + Rothstein/RCA) is racking up some amazing stats on iTunes, Spotify and YouTube. Released during his hosting and performing stint on Saturday Night Live on 5/5, the video for “This Is America” has been streamed more 110m times worldwide, becoming the most-viewed music video on YouTube for nine days in a row. The video is also tied for the fifth-fastest music video to reach 100m views in YouTube history. Internationally, the track remains #1 position on Spotify’s Global and U.S. charts and has reached #1 at iTunes in 45 markets, including the U.S. It's #3 at Apple Music. 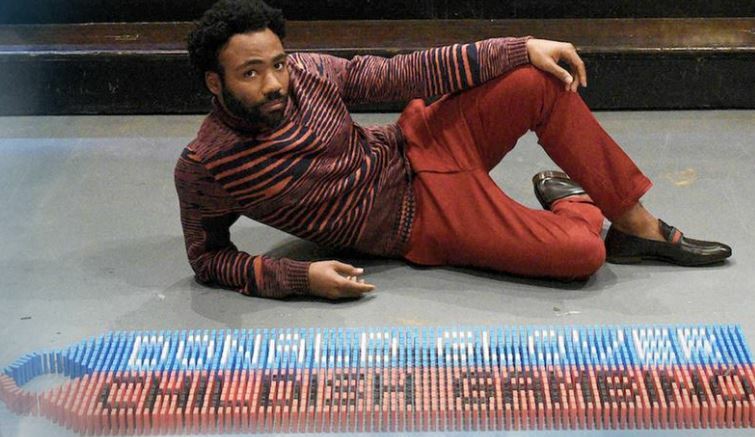 "America" was one of two tracks Gambino performed on SNL. Be advised that the clip, directed by Glover's Atlanta collaborator Hiro Murai, contains some graphic violence. You can read our own Michelle Santosuosso's thoughtful take on the song and video here. As excitement crests for the multifaceted artist's upcoming full-length, Peter Edge and his RCA team are already reaping the results of prevailing in a highly competitive contest to ink Gambino, one of the biggest A&R coups of the last year. The artist also closed a pub pact with Kobalt. Gambino's Glassnote releases, Awaken, My Love!, Because the Internet and Camp, bubbled up at iTunes after the SNL performance, and his two most recent titles remain in the Top 50. Gambino, whose Grammy-winning left-field smash "Redbone" went triple platinum, kicks off his tour with Rae Sremmurd and Vince Staples in Atlanta on 9/6. Glover is also, of course, Lando Calrissian in the new Star Wars prequel, Solo, and Atlanta continues to be among the most loudly buzzing, acclaimed series on TV. We're grateful to him for making us so vividly aware of how little we've accomplished.